Joseph Smith, the founder of Mormonism, as a boy had his earliest spiritual experience by having a vision of Jesus in the wilderness. We demonstrate elsewhere that the fact it took place in a wilderness means it comes under Jesus's warning of imposters who appear in the wilderness saying "I am Jesus." See Imposter Analysis Applied to Smith's Vision. This would imply it was 1822 when Smith was 16. Smith himself said this was a vision during his cry "in the wilderness." For reasons explained in relation to Paul's similar vision, this vision could not be valid because it was seen in the wilderness and was not universally experienced. 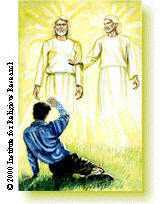 See the article "Imposter Analysis of Matt 24 Applied to Mormonism"